After spending an entire day with scientists in the No7 lab in the UK, it became clear to me there's more to the brand than just a bit of skincare and makeup. Its collection of products, made popular across the pond for its low price points and effective formulas, has a rich history. I pressed each person I came into contact with for more information about the packaging, the ingredients, how the new "millennial" serum is made, and why everyone seems to have fallen in love with the products. Below find the fascinating takeaways. "Right from its inception in 1935, we knew No7 would be a special brand," notes Frédéric Arbel, the executive director of marketing at Boots. During the war, No7 continued to manufacture a small selection of products in smaller sizes to make the distribution and availability more widespread and fair. In the '50s, the brand addressed women in their new roles in the workforce, enjoying the financial and social freedom that came along with it. "No7 has had nine different looks over the years. During the war, we used utility packaging due to a shortage of certain materials. The relaunch in 1952 came after 17 years of just one design. Times had changed—we'd gone through the horrors of WWII and extreme rationing and had come out the other side. People were ready for change, excitement, and some luxury. No7 relaunched in the honey and gold color with a new logo and a sprinkling of stars. From there, the brand has relaunched relatively frequently to keep pace with the times." Arbel discussed how important it is, especially now, to recognize the positive impact women make in our world and allow whoever wants to use their products to dictate their own beauty choices. "We combine science and service to create products," Arbel continues, noting the brand is not "anti-aging but rather more interested in supplying skincare that will help put whoever uses it in control." "In March 2007, a program called Horizon aired on the BBC in the UK, looking at the science behind cosmetics which claimed to prevent and repair the signs of aging," says Arbel. "It featured Manchester University, where prominent dermatologist professor Chris Griffiths and his team carried out independent research into cosmetic anti-aging products. The study compared the effect of the original No7 Protect & Perfect Serum ($25) on collagen production with the performance of retinoic acid—a prescription drug used to treat severe photoaging of the skin. "Professor Chris Griffiths found that at both a basic science and clinical level, No7 Protect & Perfect Serum scientifically repaired photoaged skin and improved the fine lines and wrinkles associated with photoaging. Professor Griffiths's breakthrough study was also published in the British Journal of Dermatology and the Journal of Investigative Dermatology. Following a broadcast of the program, No7 Protect & Perfect Serum became an overnight sellout, attracting lines and crowds of women across the UK and internationally." "With concerns about pollution and a more stressful lifestyle on the rise," says Arbel, "women in their 20s and 30s are more aware of the preventative measures to protect and maintain the healthy appearance of their skin. 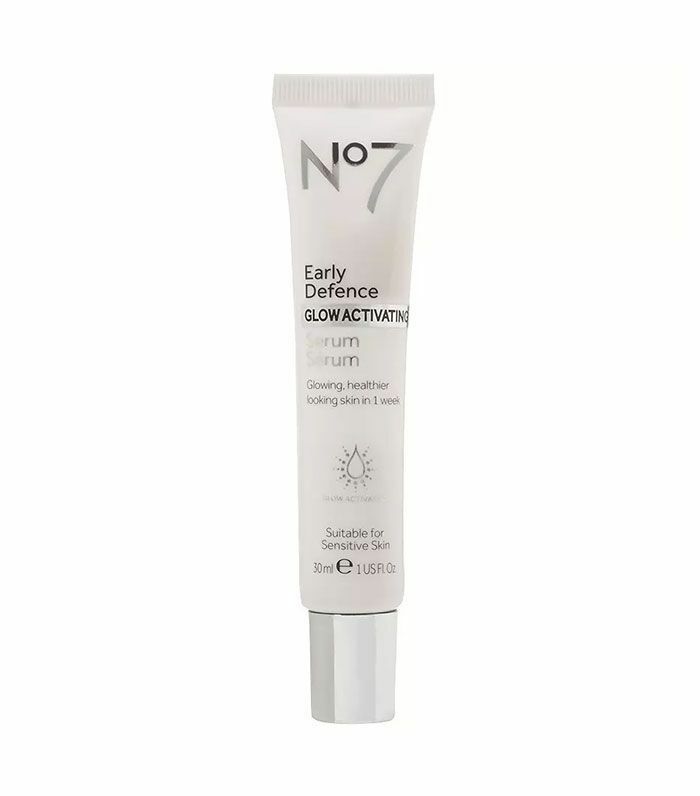 The fast-acting formula in the new No7 Early Defence Glow Activating Serum ($25) works to boost skin's natural surface renewal process, helping clear and refine the appearance of pores for glowing, healthier-looking skin (with visible results in just seven days)." The serum, which should be applied morning and night before moisturizer, also protects against pollution and environmental stressors to keep skin looking young. "Its formula, with vitamin C and ginseng, restores radiance and leaves your skin energized. Rice peptides are included to help boost skin's defenses against pollution, stress, and free radicals to maintain younger-looking skin."